Please click on a link above to advance to the appropriate section. Four years after the founding of Marshall in 1830, the Village fathers felt it necessary to create a new office which would deal with the law and order of this fledging young settlement. This new office or position was the Town Marshal, and the very first citizen elected was Charles Dickey. Mr. Dickey, who immigrated from New York, received a total of 37 votes. He served from 1837 to 1839. In 1840 he was elected as a Village trustee, and in 1847 Mr. Dickey would serve as Village President. The rapidly growing Village began to experience typical pains of expansion and growth. With more settlers arriving almost daily, the Village’s streets began to swell. Like in modern times with an influx of people comes the need to introduce new laws and create a means to uphold them. To accomplish this, the Village Council found it necessary to bring about new positions of authority to enforce them. The Village appointed constables from each ward, who would assist the Town Marshal in overseeing the law and order in their particular district. They mainly dealt with property disputes, neighborhood squabbles, and serving civil processes, leaving the major enforcement up to the town marshal. The constables were only paid when actually conducting Village business, and had little real authority. Later in the 19th century, the Village also hired a night watchman, who would patrol the village’s business area. The watchman was appointed by the Village President for a one year term, and was to serve under the direction of the Marshal, who was the ex-officio Chief of Police. It was the watchman’s duty to light all the street lamps in town every night prior to conducting his patrols. If a citizen needed him, he or she would bang a club on a steel pole that was erected on State Street (Michigan Avenue), in front of the old Detroit Urban Railroad Depot. (Presently the site of Walters Tire Center). The clanging of the pole could be heard up and down the street, and the watchman would come running to the aid of the citizen in distress. The Village also elected local Justices of the Peace, who would hold trials for violators of local ordinances, conduct weddings, and hear cases of a civil nature . They were political positions, and in some cases the Justices had little or no legal background. The more serious capitol crimes were dealt with by County Circuit Judges, who were also elected in county wide elections. Circuit Judges would travel throughout the County to hold their trials. The first Calhoun County Court house was built in the center of the village, at the intersection of Kalamazoo and Michigan Avenue where the Brooks Memorial Fountain now stands. In those days this location was referred to as Court House Square. It remained their until 1873, when it was torn down and replaced with a new court house on Green Street, where the present Court House stands. This Court House was also torn down in 1956, when it was replaced with the present building. In the early days, one of the biggest problems the Marshall had to deal with was controlling domestic animals who would be found roaming at large. Many residents in the village kept small numbers of livestock, which would include horses, cows, sheep, swine, chickens, etc. Often in a busy little town, a roaming animal on main street could cause disruption, and sometimes chaos. Things got bad enough, that the Village had to build an animal pound on Prospect Street to house the animals found roaming about. They also employed a part-time Pound Master, who’s duty it was to corral these wayward critters, and confine them until their owners could be located. For each domestic animal, the Pound Master would levy a seventy-five cent pound fee, unless it was a bull or a stallion, which would cause the fine to increase to five dollars. There was also an ordinance that made it illegal to display or expose a bull or a stallion indecently. This too could cost the hapless owner five dollars, which was a pretty stiff fine in those days. Traffic problems were of course, much less severe than they are in our mechanized world of the 21st century. But there were still concerns. The Village had ordinances prohibiting horse racing on any street or alley, and you could expect a five dollar fine if you were apprehended riding a horse on any sidewalk in town. Even speed was a concern, as the law controlled the speed of riders and buggies on Village streets. On State Street, you could only ride or drive six miles per hour, on other less congested street you could increase your horses speed to ten miles per hour. This fear of speeding horses and runaway carriages also affected the speed of trains pulling through town, as they were only allowed to travel at eight miles per hour. The fine an engineer might expect for exceeding this speed was fifty dollars, and he could be sentenced in the County Jail for sixty days. As in modern times, the Aldermen were also concerned about the beauty of the town, so an ordinance was created to prohibit the hitching of horses to any ornamental or shade tree belonging to the Village. Along with these kinds of concerns, an ordinance required each store and shop owner in the downtown area to clean and sweep the sidewalk and street in front of their businesses each Saturday morning before ten. If they failed to do so, the Village would hire the town swamper for a 25 cent fee to do it for them, and the Marshal would levy an additional $1.00 fine. Their lack of cleanliness could become an expensive over sight. At the turn of the 20th Century, the telephone came to Marshall, which provided a relatively new way to summon the police. The switch board at the Citizens Telephone Company, was located downtown over what now is the Sullivan’s Insurance Company. The night operator would notify the police of trouble by turning on a red electric light that was located on the front of the building. The night watchman would eventually spot the light and check in with the operator to see what the problem was. The old gooseneck that held the light can still be seen sticking out of the front of the building. This is a far cry from the modern 911 system being utilized in Marshall in the 1990’s. About this time, there was a tough old watchman by the name of Charles Burkhardt. He was a big, no-nonsense man whose favorite form of justice was a swift kick in the seat of the pants of any young rascal who would dare misbehave while he was on duty. His reputation throughout the county was usually enough to keep most scalawags in line. Later, in 1926, the City hired its first traffic officer, William Vosburg. Several years later, Bill was appointed as the City’s first Chief of Police. The following year the department was allowed to expand, and the Chief was able to hire its first patrol officer, Jess Purcell. Jess later became Sheriff of Calhoun County. 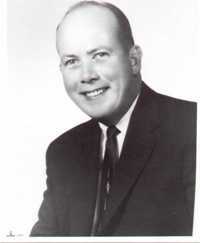 Bill served the City of Marshall for 30 years, retiring in 1954. He coincidentally passed away in 1984 in the back seat of a patrol car, suffering a heart attack after a minor traffic accident. Bill was 85 years old. The first police department was originally located in a building on Eagle Street where Schuler’s, Winston’s Pub now stands. It was a small town affair that mainly was used to drop messages for the officers on duty. In 1930, when the City celebrated its centennial, the Town Hall was moved to the renovated "old livery" where, it stands today. 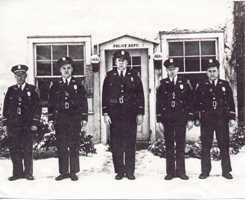 The police department moved too and was housed in the blacksmith shop on the east side of the old stone barn. It stayed there until 1975, when it moved to its present location in the town hall where the fire headquarters used to be. Following is a list of Village and City Marshals, beginning with Charles Dickey, who served the village from 1837 to 1839.
the last Village Marshal was Ezra Lusk, 1858. Chief Bill Vosburgh stands next to his 1926 Indian Motorcycle. Bill Vosburg was Marshall's first Police Chief, hired in 1926 as a traffic officer. Bill was a World War I veteran who rode motorcycles during the war. He came to Marshall looking for a job, and was fortunate to find one that involved his love of motorcycles. Before He was hired, Mayor Harold Brooks asked him, "if you caught me speeding, would you give me a ticket?" Bill said, "you're darn right I would." Mayor Brooks then said, "you're hired, you are just the kind of man were looking for." 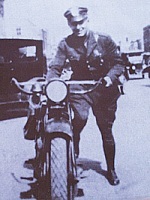 Bills starting annual salary was $2400, which doesn't sound bad for the 20s, but out of that he had to buy his own motorcycle, uniform, gun, and any other equipment he might need. With the hiring of Chief Bill Vosburgh, a new mechanized era of law enforcement came to Marshall. This Indian motorcycle was purchased by Bill in the late 30s or early 40s. This is how the motorcycle looks today after being completely restored by a collector in Illinois. The following article is copied from an article published in the December 2001 American Motorcyclist Magazine. 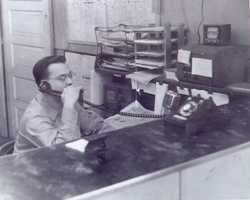 Seen here is Desk Sergeant Herold Reuss manning the old dispatch center. This area is where the current ambulance office is located. This photo was taken in 1959. World War II drew Chief William Vosburg to join the war effort. As Vosburg was off fighting for his country, Don Henley was appointed to act as Chief of Police. 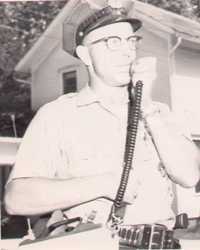 Seen here is Officer Harry Fox with the first portable radio used by the Marshall Police. This photo was taken in 1959. 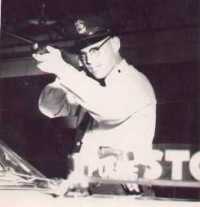 Seen here is an old patrol rifle carried by the Marshall Police circa 1950's.